The seventh grade Highlanders finished their regular season undefeated, with a record of 11-0, winning the majority of those games by more than 20 points. The Highlanders played Moraga, Albany, Martinez and Longfellow (Berkeley) Middle Schools twice each, and Orinda, Stanley, and Lincoln (Alameda) once. Working with coaches Drew Nash and Mo Bowie, the Highlanders showed off their skills and their speed throughout the season. Team members included Gracie Ellis, Ashley Gao, Gabrielle Garcia, Maeve Gilbert, Erin Hong, Julie Huffaker, Frannie Lahey-Teare, Maxine Miller, Erin Sturdivant, Zoe Rickard, Megan Tang, and Emily Yu. 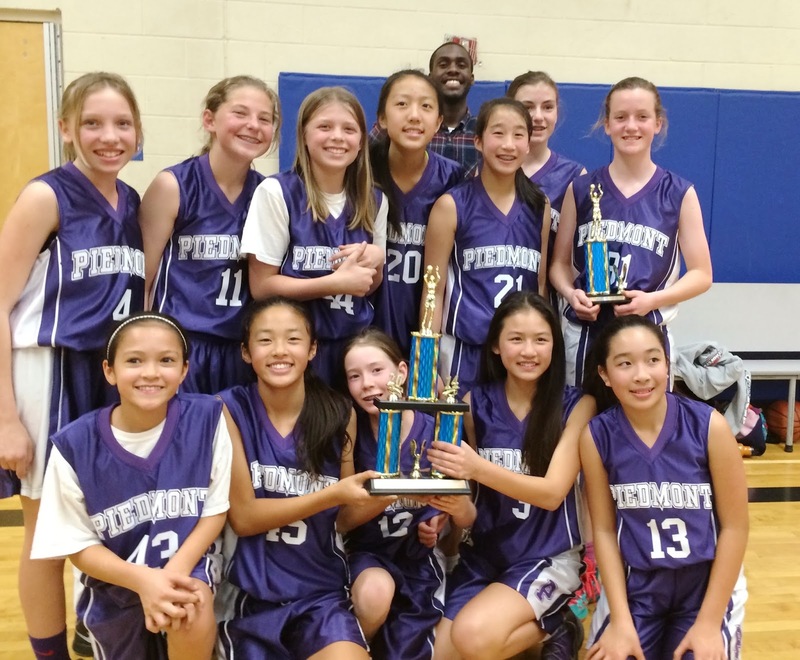 Playing strong through three games during finals week, the 7th grade Highlanders went 2-1 in the end-of-season tournament, capping their 11-0 regular season with a third-place trophy. On Thursday, the Highlanders prevailed against an energetic Orinda team. Guest coach Parker kept the defense moving and the Highlanders won a narrow victory, setting them up for the third-place battle. On the defensive end, Frannie Lahey-Teare had several steals and blocked shots; Maxine Miller and Zoe Rickard also forced turnovers while Erin Hong used her speed to thwart the Martinez offense. Emily Yu and Ashley Gao were strong on the boards with several rebounds each, as was Maeve Gilbert. Erin Sturdivant and Zoe Rickard sparked the offense and were in the right place at the right time. The Highlanders’ showed real team play and good ball movement throughout, and ended up with a 19-16 win. The referees named Gracie Ellis one of five all-tournament MVPs. Welcome to Piedmont Middle School Sports for 2014-2015! If you have any game reports or photos of PMS teams in action, please send them to pmsboosterspublicity@gmail.com for possible inclusion in the Piedmonter, Piedmont Post, and Piedmont Patch. They also will be posted here.